I saw this quote and I felt I should say something about it. I started this weight loss journey when I was a child. I tried to lose weight for years. I was never able to keep it off for a month, much less a year. I didn’t come to Overeater’s Anonymous until I was 44 years old. I am now 46 years old and I am closer to a healthy weight than I have ever been in my life. Don’t let the idea of middle age, menopause or anything else get in the way of your success. You can do this, no matter what your age. Don’t let this fat kill you just because you think you can’t do it. 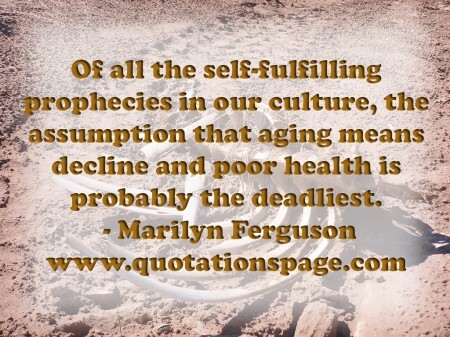 Don’t be a victim of that self-fulfilling prophecy.